With rumors that Apple may talk about multitasking on iOS 9 – a key feature of the anticipated iPad Pro tablet – next week at WWDC, Microsoft highlights the ease and power of juggling multiple windows on Windows 10 with a feature called Snap. With Windows 10, there will be even more ways to Snap and multitask with multiple windows. The ability to effortlessly snap two desktop windows side-by-side was introduced originally on Windows 7 as Aero Snap. Users can drag any window to the edges of the screen, and the window would expand to fill the screen or take up height of the screen. Windows 8 refined the feature for Modern UI apps, allowing two apps to run side-by-side simultaneously. While the ability to snap two windows side-by-side with Windows 7's Aero Snap was useful, Microsoft is taking this a step further with Snap Assist on Windows 10. "When arranging two windows side-by-side, we noticed in practice that this scenario frequently involved snapping the first window and then spending time wading through other windows on screen to find the second one to drag and snap," Microsoft said in a statement. "This insight lead us to ask: instead of making you hunt for the second window to snap, why not present a list of recently used windows up front?" This makes it more efficient to choose which app to snap into the second window, and Microsoft found that 90% of Windows Insiders choose an app to snap in the second window from the recent list. Corner snap is a useful feature for users working on larger displays or high resolution screens. Corner Snap takes Snap Assist a step further, offering users the ability to snap up to four windows together rather than two. "To snap a window to a quarter size of the monitor, just drag the window to a corner and let go," Microsoft said of the feature. You can also arrange your screen with different configurations, including an app taking half the screen, and two apps in the other half of the display. Or, you can have four apps snapped together, each taking a quarter of the display. Snap fill allows you to easily snap windows into configurable sizes. The feature is similar to Aero Snap, but rather than automatically snapping two windows together that each occupy 50% of your screen space, Snap Fill allows you to allocate a larger portion of your screen to one app and then fill the remaining portion of your screen with a second app. "In Windows 10, we wanted to bring this improvement to the desktop, making snapping more intelligent with any app," Microsoft said in a statement. "When you snap a window and resize it, the system takes note of your action. When you then snap a second window, the system will optimize its size to automatically fill up the available space." For enterprise users who use multiple displays or for those with hybrids and two-in-one notebooks, Microsoft is also making Snap easier. 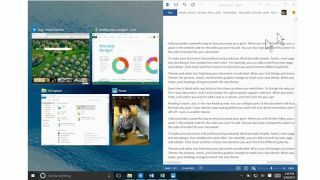 Windows 10 allows multi-monitor users to snap to a corner or edge shared by both displays, a feature that was previously not possible with earlier versions of Windows. Snap Assist will let you see all the windows across all displays so you can snap different screens together more easily without having to drag the windows across your displays. For hybrid owners, Snap works seamlessly with Continuum, allowing you to preserve your Snaps when you switch between notebook and tablet modes. As Store apps are now opened in resizable windows alongside traditional desktop apps, Windows 10 allows users to snap both types of apps together. Windows 10 will launch for consumers on July 29 as a free upgrade during the first year of availability for users of Windows 7, Windows 8 and Windows 8.1. If you don't qualify for an upgrade, or you've built a new PC and need a fresh copy of the operating system, Windows 10 starts at $119 for the Home edition and $199 for the Professional edition.